Hello, my name is Kristina, and I love pickled things. I also love appetizers, so if I have a chance to sit on a patio munching on an appetizer, sipping a beer in the sunshine I’ll do it. Wasatch Brew Pub has a new chef and a new menu, including tater tots with truffle salt and fried pickles. 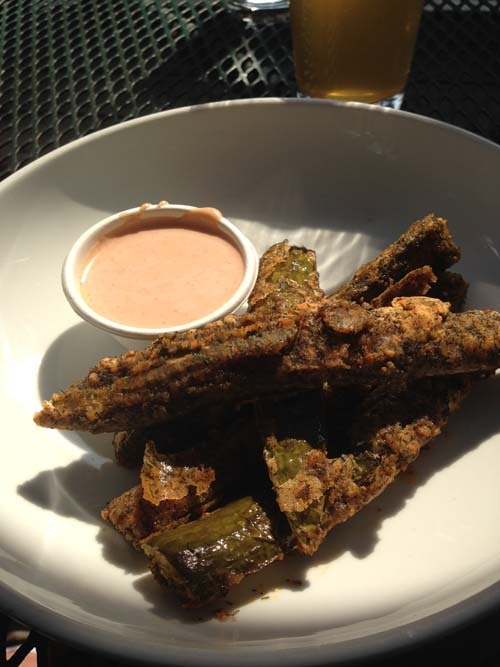 These are the fried pickles. My recommendation? YES. So firstly, it’s a fried. pickle. A FRIED PICKLE. The breading was full of dill and lovely. My batch was a bit soggy in places, but that will change from cook to cook, and it’s still a fried freaking pickle, so I’m just not concerned with it. The dipping sauce was a flavored ranch, which was fine and not a crutch, but the beauty of course is the pickle. Sharp, crisp garlic dill spear.